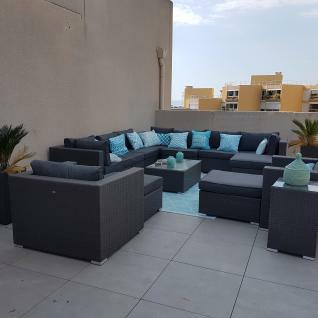 Our trendy Tripoli sofa set can adapt to large terraces of all styles. 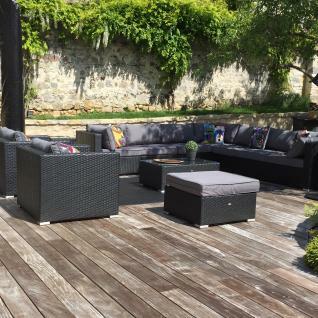 This is the biggest garden sofa set on offer at Alice's Garden. It can accommodate 14 people comfortably so you can enjoy those precious outdoor moments with the whole family. 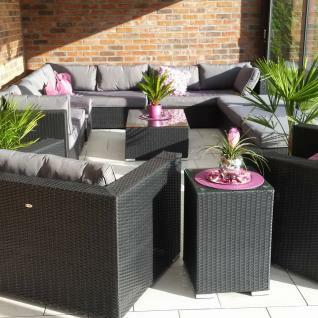 Polyrattan is a resistant, on-trend material that creates modern garden sets. 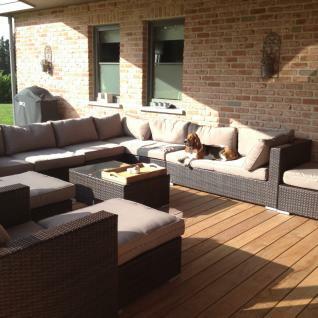 Polyrattan is similar to natural rattan and gives the Tripoli set an elegant and designer look. This allows you to set up this sofa set either inside or outside. The grey / grey Tripoli offers the utmost comfort with its 12cm-thick armrests and backrests. Its padded cushions make this piece as comfortable as an indoor sofa. The Tripoli comes with a pack of 14 connectors so that you can attach the various modules together. The bound edges of the cushions guarantee a chic look. Alice's Garden carefully selects the best-quality materials to weave its furniture. That is why the Tripoli is exceptionally durable! Alice's Garden rattan stands up to the sun's rays and poor weather (snow/rain/salt water). The cushions have removable covers and are water-resistant. This means they can withstand small splashes and drizzle, however we recommend storing them inside when there is heavy rain. 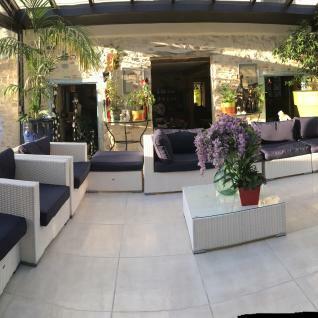 To guarantee maximum sturdiness, the frame of the garden sofa set is made from reinforced aluminium (which, by nature, does not rust). Aluminium frames are also lighter than steel ones. The tops of the coffee tables are made from 5mm-thick toughened glass, which is 5 times stronger than traditional glass. Already assembled, ready to be used! Adjustable – assemble your garden set however you want! We offer a cover compatible with the Tripoli that protects it from the elements and winter weather. Click here to see it in our online catalogue. Please note: There may be some slight differences in colour in comparison to the images as our products as this will depend on your screen's settings.